May is here, and there are a few more programs left in the spring season! Check out the complete schedule for May programming in the Spring Activity Guide, which can be found at Town Hall, Palisade Chamber, and Mesa County Public Libraries. Just a reminder, online registration is available, but must be done with credit card. Cash and check enrollment must be done in person at Palisade Town Hall. Our Summer Guide will be available to the public on May 10th and all summer programs, including swim lessons will be available for online enrollment starting May 17th at 6:00 AM. Registration can be done with this link https://townofpalisade.sportsiteslabs.com/player. Festival Tickets: Have you bought your tickets to the 10th Annual Bluegrass & Roots Festival? Music starts on Friday, June 8th and will go through Sunday, June 10th. Buy single day tickets, three day tickets, or general camping is also available. Visit https://www.palisademusic.com/ for a complete schedule of performers, to volunteer, or to buy tickets. Early Bird ticket pricing is available until May 31. Looking to volunteer? We still have spaces available to volunteer for the festival this year. COMMUNITY GARDEN: Looking for a place to plant your garden? The Town of Palisade has spaces available at the Community Garden on West 4th Street. Plots range in size and price and are rented out for the full year. All plots include soil and access to city water. Reservations can be made at Palisade Town Hall, reserve by June 1. Palisade Plunge Fundraiser: Kick off summer on Thursday, May 24th with an event that will raise funds for the Palisade Plunge Project. The event will take place downtown Palisade from 5:00 PM-8:00 PM and will feature live music by Bluegrass Offenders, Clunker Bike Race, and a drink tent complete with many native Palisade favorites (Palisade Brewery, Talon Wine Brands, & Talbott’s Cider). The Clunker Race will start at 6:00 PM, participants are encouraged to decorate their bikes and dress in costume to race a mile down Main Street for bragging rights and cool swag. Race entries are all donation based. Door prize drawings will also be given away throughout the night in the Plaza. The Palisade Café will be donating 25% of the day’s proceeds to the project as well. All proceeds from drink and snack sales and race entries will go towards the Palisade Plunge. Early Registration Event: Summer is almost here and it’s time to start thinking about swim lessons and pool passes. Early Registration for swim lessons and discounts on pool passes will beginONLINE ONLY on May 17th at 6:00 AM–May 18th at 6:30 PM. In-Person registration and pool pass discounts will be available from 3:30 PM-6:30 PM on May 18th at the Palisade Pool. Season pass discounts will ONLY be available during these designated times. Palisade Swim Team: Swim Season is here! Advanced swimmers, ages 7-17 are invited to join swim team, all participants must be able to swim 50 yards continuously and must be proficient in freestyle, backstroke, and breaststroke. Practices will begin on June 5th at 8:30 AM and practices will be held every Tues & Thurs through Aug 2nd. Perspective team members are welcome to try out at no cost on Thursday, May 31 at 8:30 AM. Registration is $105.00 for the full season or $58.00 per month, full season payments must be received by June 7th. Group Fitness: All classes are held at the Palisade Community Center and are open to ages 14 and over. All Yoga classes will resume as scheduled this week. Summer Teaser: Coming this summer kids ages 3-6 will be able to participate in programs such as Little Explorers, Session 1 starts June 12; Little Scientists, starts on July 24th. Kids Ages 2-5 will have two separate summer parties featuring Red, White, & Blue Party and the Little Peaches Party. Get your copy of the Activity Guide on May 10th. Walk to School Day (Elementary Kids & siblings): May is National Bike Month and Grand Valley Bike Month and we Palisade Rec wants to encourage kids and their families to walk or ride to school on Wednesday, May 9th. Participants will meet at the Palisade Community Center between 8:00 AM-8:30 AM and form a huge bike and walk train over to Taylor Elementary. All participants will receive stickers and will be entered into a drawing for prizes later at school. Palisade Fire will also be onsite for a touch a truck, and Palisade PD and Fire will assist in helping students with street crossing. The event is FREE and open to Taylor students and their families. Summer Teaser: The first of the summer programs will feature a Field Trip to the Mica Mine on June 13. In August there will be another field trip offered to both the Eureka Science Museum and the Children’s Nature Center. Some of the summer camps will include Wrestling Camp, Fishing Camp, and Science Camp. Gray Gourmet: Meet new friends or catch up with old friends each week at the Gray Gourmet meal, every Tuesday at the Palisade Community Center. Doors open at 11:00 AM and the meal is served at 12:00 PM. Participants are welcome to come at 11:30 AM for dominoes or cards. Advanced reservation is required, to reserve a seat call 243-9844 X1. Summer Teaser: Once again the Historical Society will offer monthly history walks with the first one taking place on June 1. The Library will offer a Smartphone photo class in July, DIY classes held each month and the first one scheduled is Garden Markers on June 13th, and once again the GVT will offer a travel training class in July. 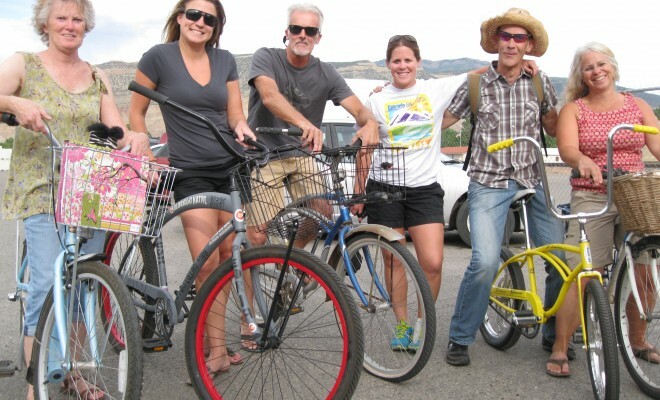 Group Bike Ride: Enjoy a fun leisurely 9-11 mile bike ride through Palisade Wine Country. The rides are free to join, but do require a minimum of 3 people to run. Riders should bring their bike and must ride with a helmet. The first ride will take place on Tues, May 8th. Meet downtown Palisade by the Plaza at 8:50 AM, depart by 9:00 AM. The next bike ride is scheduled for Tuesday, May 15th at the same time. Monday Morning Hiking Club: Join us for the next Monday morning hike on Monday, May 14th with a 3-4 mile hike in Grand Junction as the group hikes Time Machine and Ali-Ali. This trail is moderate in difficulty. The group will meet at Palisade Town Hall at 7:50 AM and take a shuttle to the trail. GJ pick-up is available, but must be arranged by May 10th. Hikers should pack water, snacks, dress in layers, and extra money for the stop at Trail Head Coffee on the way home. Registration is $4.00 per person, RSVP by May 10th. Dogs Welcome! The last hike of the Spring Series will take place on May 21st with a 3 mile hike along East Creek in White Water. Summer Teaser: Summer outdoor recreation will feature Stand Up Paddle Board classes in July, Summer Hiking Series starting June 4th, Grand Mesa Water Tour on June 25, an Art Tour with lunch at Palisade Pies onJuly 10th, even a trip to Aspen in August. Next Story → Gear Up for Summer in Palisade!